Half-Hour Hegel: The Complete Phenomenology of Spirit (eventually): Hegel Holiday Party - Join Us And Raise A Glass! Hegel Holiday Party - Join Us And Raise A Glass! 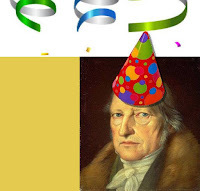 This month, we've got a milestone to celebrate in the Half Hour Hegel project, and I'd be happy if you'd join me in an online session to do precisely that! We've passed the 150-video mark in the series, and are very close to the half-way point of the entire Phenomenology! There's still some material - and very cool stuff, actually - to cover in the 200+-paragraph-long Reason section, but we're almost done with that section of the work, and ready to move into the massive, rich, and fascinating Spirit portion. I'm going to be opening up the last Google Hangout of the year tomorrow, December 23, from 2-3 PM Central Time - that's where we'll have the party (and I may well stay on for a good bit past the official end-time, depending on what we talk about). I'll post the link to the hangout as soon as it opens on my social media - my Google+, my Facebook, and my Twitter. I'll be having a beer or two as we carry out our discussion. Whatever it is that you'd like to drink - beer, a cocktail, apple cider, coffee, hot chocolate. . . . - I invite you to join us for a toast to the success of the project, and some enjoyable conversation about Hegel and philosophy! What "Pleasure in Pleasure and Necessity"?